In Gary’s speech at Elevate New York 2013 (watch it here) he talked about the difference in marketing between ten years ago an now. And how marketers (most of them) refuse to adapt to the times of now and keep using old school methods (almost) nobody opens/watch anymore. Methods that become more and more expensive while turning into less and less efficient ways to bring in results. Some of the old school methods mentioned are the direct email, email marketing, printing, radio and TV. Even AdWords has announced a decreased in ads click of 15% the last year. Same goes with sites like Groupon, that a few years back was a real success, now emails from them are considered spam and annoying. Time and attention are the most valuable assets now, and marketers should use new ways to get this from people. Gary suggest to think about the things a few years back we wouldn’t think of doing. Of things we don’t necessarily like or approve of. And put aside our “fear” and use these to market our business. We need to flip it – and use storytelling in at least four social media channels today: Facebook, Twitter, Pinterest and Instagram. Also, we should drop the things we ourselves don’t use anymore – how many ads do we still click on? Or how many emails do we run to read? Close to none? Therefore, drop it. Their efficiency is close to 0 today. The social networks are 2 ways conversations that we should use to natively storytelling to bring awareness and value to our listeners. They’re not (anymore) channels to push our promotions and get impressions. That one is over. For example, Twitter is a channel we should use to listen and shut up, while we only engage in conversations, listen to people and respond (add value!). Basically, valuable CONTENT and ENGAGEMENT are the key things that are effective in the times of now. Watch Gary’s video, he’s wise but also a great speaker that will fascinate you and open you eyes about what marketing really is in the times of now. Gary is an entrepreneur with a very vast experience in a lot of fields. One of his great passions is to collect wine. As he discovered early in his career the power of eCommerce and marketing, he started using this power for his business. Gary shortly entered also in the video making business elated to his wine business. In 2009, together with his brother launched VaynerMedia, a new breed of agency that would help Fortune 500 companies like GE, PepsiCo, Green Mountain Coffee, the NY Jets, and the Brooklyn Nets find their social voices and build their digital brands through micro content and other storytelling actions. The idea took hold – what started as a 6-person project 4 years ago has swelled to a 250-strong team spread across USA. He’s now also a speaker, sharing his experience in business with people around the world, angel invest in startups like Tumblr, Path, Grand St and Uber, and randomly pop up on TV. Gary has also found a passion for storytelling and writing, being really proud of his next book “Jab, Jab, Jab, Right Hook”. In a recent event in New York he talked about the marketing of today. We’ve watched it and summarized a little bit for you. Read the lines below and watch the video when you get the time. It is truly inspiring and revealing to how we do marketing today. 1. Emails – every third person spend up to 2 hours checking his or her emails, 22% spend even more than 2 hours! 2. Internet surfing – it usually starts with a short video, then continues with another blogpost and other news stories. 4 out of 5 people spend more than 2 hours every single day surfing on the internet. 3. Watching TV – it’s hard to stay concentrated with all these available TV shows. 26% of people spend between 1-2 hours watching television every day. How many of them are you abusing? Tink is an internet service that lets you get better control and understanding of your personal finances. Tink retrieves information automatically from Sweden’s 12 biggest banks and credit cards, collects everything on one place and categorized and analyzes your total finances. You can easily track your expenses and set own goals based on categories such as food or eating out. 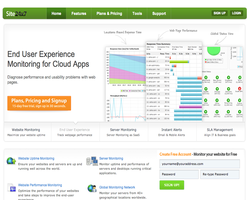 Tink is free to use and you can register to test Tink’s beta version. Tink AB was created in 2012, have 7 employees and office in Stockholm. You can collect all your incomes and expenses in your Tink account. All you need to do is to link your bank accounts, credit cards, stockbrokers or any other services. Tink collects new data automatically once it’s updated, so your account is always updated. 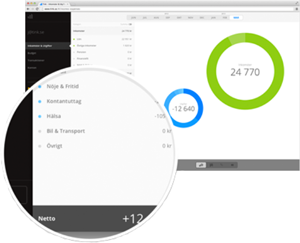 Tink compiles and categorizes all your incomes and expenses in real time. You can easily see how much money you spend on food, fuel or pleasure. You can see how expenses have changed in single categories over time. You can set a budget, either for one or more expense categories. If you want to save something special or just get better control over your expenses, so it’ll be much easier when it happens automatically. Tink notifies you when you are about to exceed your budget. 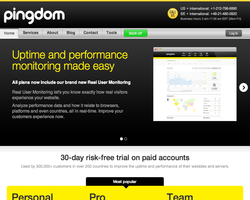 What I really like about Tink is its user-friendliness and terrific design. This services has got a big potential, let’s see what this talented team can make out of it. 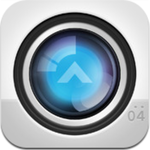 Here is a list of 10 perfect iOS applications for getting things done. 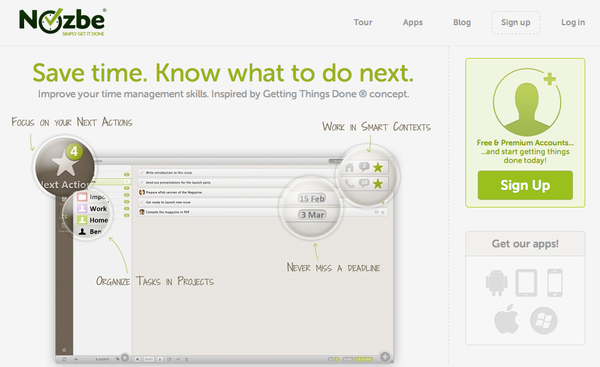 GTD is a personal productivity system to help you organize and manage your commitments and responsibilities. The goal of using a system like this is to achieve and maintain a calm, focused control of everything in your life. 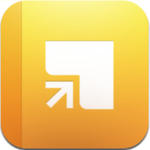 GetFlow, also known as Flow, is a task management app that’s going to help you organize your entire life. Whether you’re working collaboratively or all on your own, Flow is going to make getting things done a lot easier. 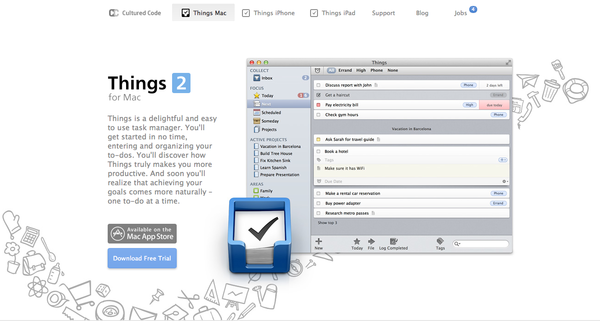 Things is a detailed task manager by Cultured Code that will help you organize your very busy life. Things isn’t just a simple to-do list, it’s a serious “get things done” (GTD) tool that allows you to create projects, each with their own set of tasks, assign tags and specific areas, and much, much more. With versions for iPhone, iPad, and Mac, and a sophisticated syncing service called Things Cloud, you can keep and update all your projects and tasks wherever you go. 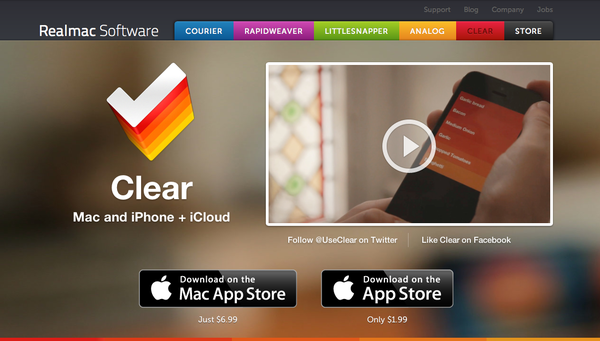 There are thousands of apps that let you create a list of things to do, even synchronize them with online services – but Clear becomes a revolutionary App with a distinguishing element, a super-simple and very interesting interface. The screen is fully occupied by lists and things to do, and all operations are made through gestures that are learned naturally and in few seconds. Instead of intrusive elements to add and manage lists of items, everything is processed throughnatural gestures, such as “open space” between two elements, or drag the list, etc. 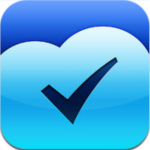 Wunderlist is a popular productivity app that enjoys excellent ratings from iTunes users. The app uses cloud computing so you can access your notes and to-do lists from anywhere, including the Wunderlist desktop app for Macs and PCs. Wunderlist’s interface is streamlined and simple, which is exactly what you want to see in a productivity app. The app has a choice of several backgrounds, and each to-do list is illustrated in a simple white-and-black design. 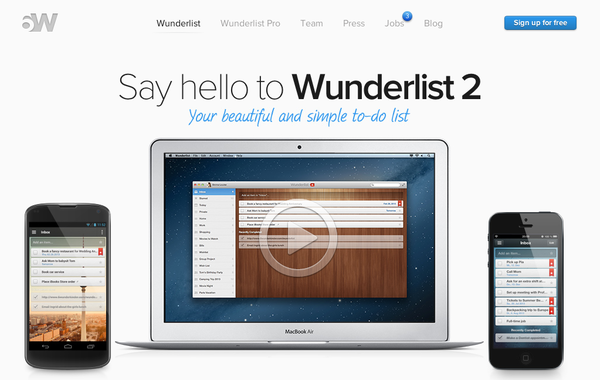 Wunderlist is compatible with the iPhone, iPad and iPod touch. It requires iPhone OS 3.1 or later. 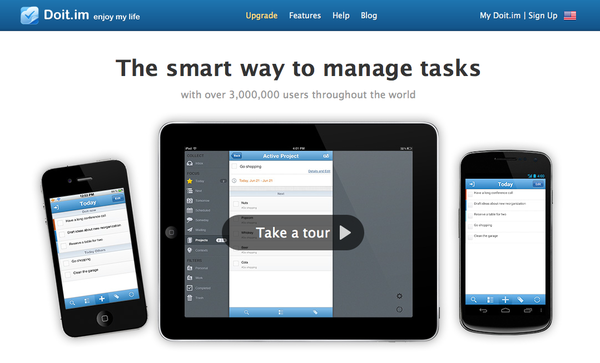 Any.DO has a super clean interface that it means to allow you to add and organize tasks quickly and easily. There are two main views that Any.DO allows you to toggle between – date and folder based. The date based view will combine all your different lists to show you what needs to get done today, tomorrow, this week, and later. It will pull them according to how you added tasks to Any.DO. Carrot, also known as “The To-Do List with a Personality,” opens with a few quick tutorial pages that explain how the app works. You start by writing your to-do items on a fairly blank page (there’s a header at the top). Drag down the screen to start a new entry. Hit “done” for the task to appear on your list. Swipe from left to right on any task to mark it as completed, and swipe right to left to reveal a menu. And that’s it. Springpad lets you stockpile notes, tasks, ideas, images and more for later with an easy-to-use iPhone app. The app synchronizes with the browser-based version at Springpad.com, too, which lets you quickly save clippings of web pages and parses useful info like ingredients in a recipe to then be added to a shopping list inside the app. The Springpad iPhone app even features a built-in barcode scanner that you can use to save info about products you come across in the real world. 2Do’s layout is carefully considered and hosts more options within easy reach than any other similar app I’ve yet come across. Inevitably, despite the app’s intuitive design, this customisability does come with the cost of reducing simplicity somewhat, but the learning curve is very slight indeed and 2Do seems to work happily on two levels: basic organising for light users, yet with a lot for power users to get stuck into. I think that 2Do has the balance just right and this will help give the app longevity. 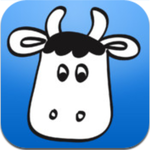 Remember the Milk’s got a great name, and the app works like a regular to-do list — you add tasks and then you can mark them complete. You can even set priorities. There’s no leaving the list at the office or at home since you can check it on any device. The syncing of the list is almost instantaneous — add something on the web and it will appear on the iPhone or Android right away. In fact, that goes for all these apps. 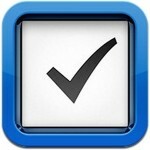 Todo® Task Manager for iPhone is a powerful set of tools that makes task management easier. You can use Todo on your iPhone, iPod touch, or iPad, keep your tasks synchronized using Todo Pro, a cloud sync service for tasks, or one of the other sync options like Dropbox, iCloud, Toodledo, or Microsoft Outlook (sync with Outlook requires Appigo Sync for Windows). Todo helps you focus on what matters most and allows you to integrate the Getting Things Done (GTD) methodology or your own. Enthuse.me is a simple, elegant service that lets you showcase your expertise in the most effective way – by cutting out the best examples of your work, knowledge or passion. Enthuse.me lets you add your basic information such as name, your job title, location or link to your website. In addition, you can import data from services such as LinkedIn, Klout, Slideshare, Soundcloud, Tumblr, Blogger, Vimeo, YouTube and Twitter. To begin creating your own Enthuse.me page, you first have to choose a username, which also forms the basis for your Enthuse.me web address (e.g. enthuse.me/carlzetterberg), and sign up manually with your email address or via LinkedIn, Twitter & Facebook. Next you upload an image and fill out a short bio defining your expertise, which acts as the slogan of your page and appears at the very top of your profile page. The next step is to grab links and other content from your various online presences, such as your career history pulled in from LinkedIn, your follower stats from Twitter, or your Klout score from Klout. The best thing about enthuse.me is its simplicity. I created my portfolio in less than 5 minutes.It’s free and still in Beta. 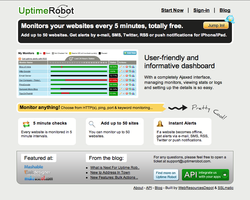 Other alternatives to enthuse.me are About.me or Zerply.com. The GTD method rests on the idea of moving planned tasks and projects out of the mind by recording them externally and then breaking them into actionable work items. 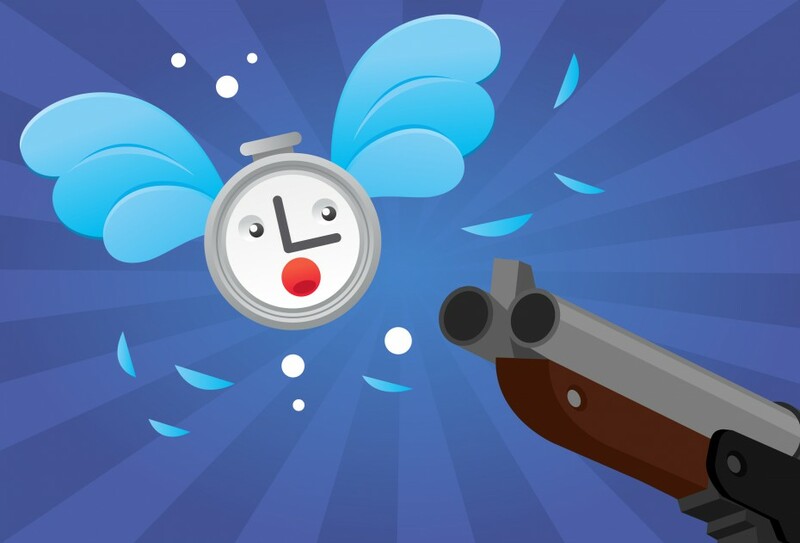 To do apps allows one to focus attention on taking action on tasks, instead of on recalling them. Here are 10 alternatives of to do apps and my personal favorites are Flow, Things and Clear below. Flow is an online collaboration platform that makes it easy for people to create, organize, discuss, and accomplish tasks. I like Flow’s intuitive interface with powerful functionality, which in my eyes revolutionizes the way you can get things done. Things is an easy to use task manager. It’s really very simple to get started and enter & organize your to-dos. Things’ smooth synchronization between your Mac and iOS devices will make you more productive. Achieving my goals has become easier with Things because of its user-friendibility and perfect design. 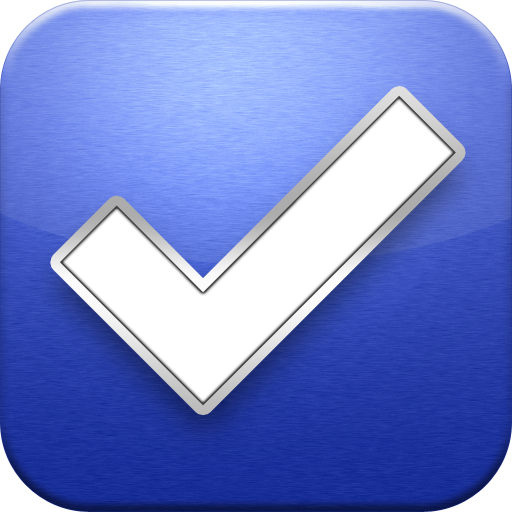 Clear for Mac works like Clear for iPhone: you can create lists, and tasks inside lists. Tasks are color-coded (according to the theme you’re using) to show a darker tone if they’re at the top of a list, and thus have higher priority. Gestures play an important role in Clear for Mac: you can swipe with two fingers to complete or delete a task, swipe up or down to move between “levels” of the interface, pinch to go back, and so forth. Wunderlist is a very simple, well designed and easy-to-use task management tool. You can create to-dos from jobs that fill your daily life and assign them to certain lists such as “Shopping”, “Work”, “Private” or anything else you would like. If you have any new tasks that spring to mind, just open Wunderlist and write them down. You can even share your lists with colleagues, friends and partners. This will increase your productivity in every aspect of your life. The best thing about it its free plan which doesn’t reduce your possibilities to be more productive. OmniFocus is designed to quickly capture your thoughts and allow you to store, manage, and process them into actionable to-do items. I would recommend this application to more advanced users as its interface is not as easy as Flow’s, Wunderlist’s or Things’ one. 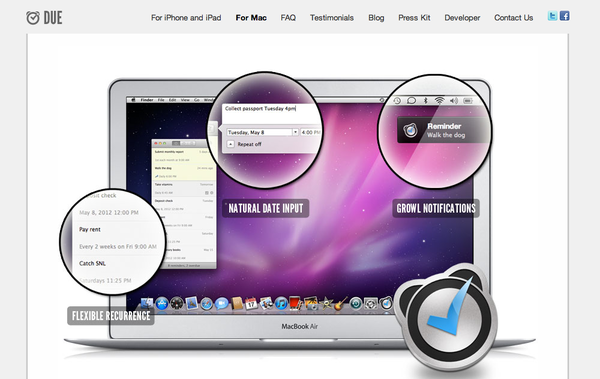 Due for Mac is an application for your OSX device aimed at setting and receiving super-fast, highly efficient reminders. It features several smart functions such as quick entry shortcut, which makes it really easy to stay on top of things. 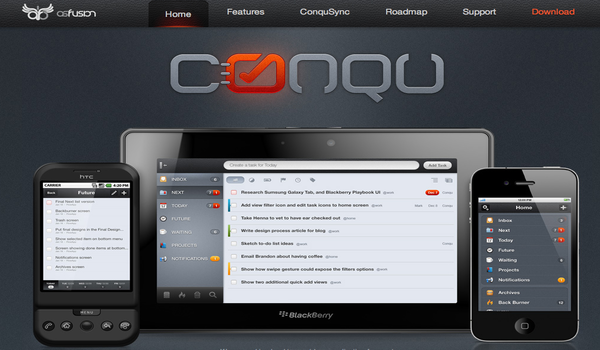 Conqu is a good, yet odd in places, looking GTD specific app for a host of platforms, including not so common ones such as Blackberry Playbook and Nook Color. With a decent feature set, clearly and simply laid out. It doesn’t include some features the most GTD apps do, however, you’ll definitely like its design and uniqueness. Individuals and professionals looking for a new way to manage projects can turn to Nozbe. 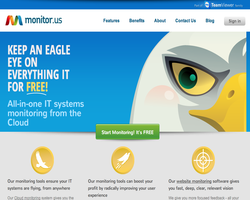 This web based application allows for single and team management of tasks and projects. 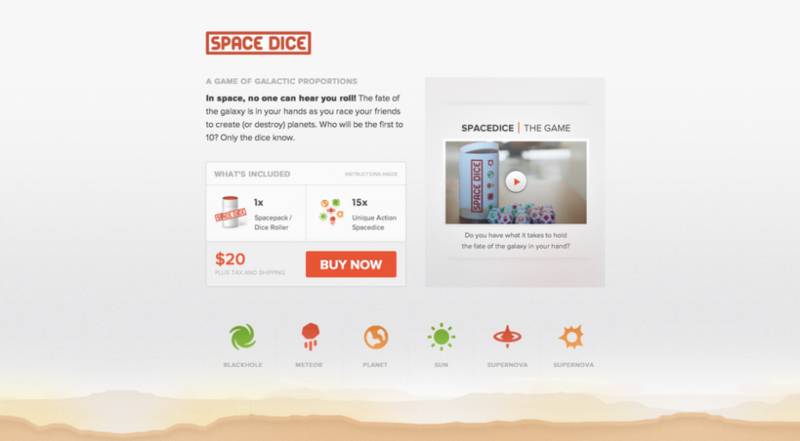 Users can create an account and work towards meeting goals through the use of actions, contexts and tasks. Access is available a few ways which allows greater flexibility for the user. The best thing about is its price: free. One thing that some applications are very good at is assisting with productivity. Doit.im is another reincarnation of this type of application. 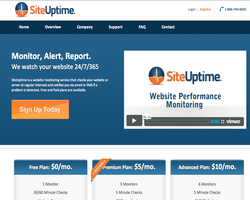 This particular tool offers a very appealing design and many functions to help users get things done on time. Using Doit.im, users can juggle multiple tasks and collect ideas through a Doit.im inbox. These ideas can be processed and organized. They can later be reviewed or scheduled as a to do item on a to do list. 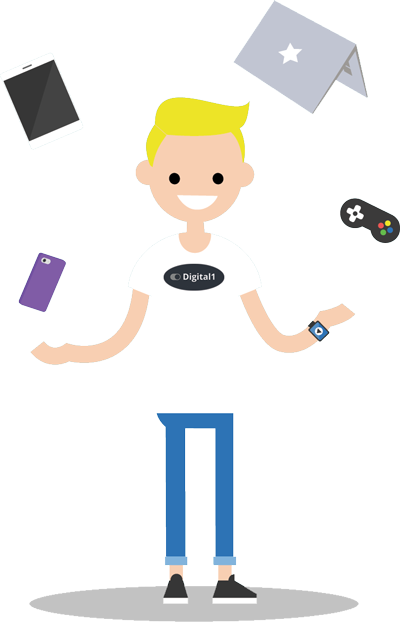 Doit.im is compatible across many platforms, including Windows, iPhones, iPads and Android mobile devices. Doit.im also utilizes cloud processing so the user can easily retrieve data stored in the cloud. 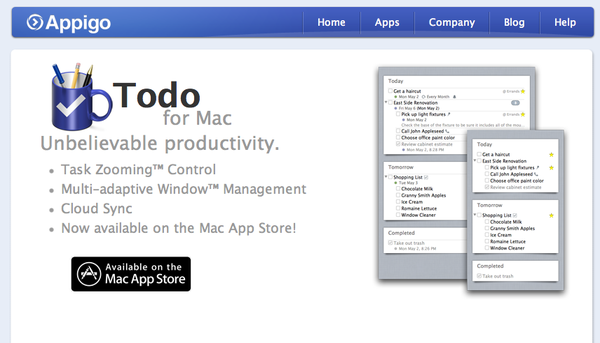 Todo for Mac brings together features from Todo for iPhone, Todo for iPad, and Todo Pro and redefines productivity on the Mac Desktop. Built on top of the same synchronization platform, Todo for Mac includes Cloud Sync with Todo Pro, iCloud, Dropbox, and Toodledo. 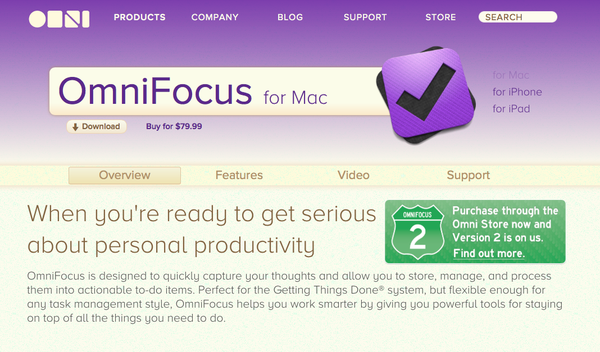 In my opinion, it’s definitely capable of competing against more expensive applications such as Things or OmniFocus. Large and small displays on the wall, that show different statistic and other live data, have become very popular at tech companies. Several developers are beginning to offer tools for big screens as many big boards are now driven by custom code. 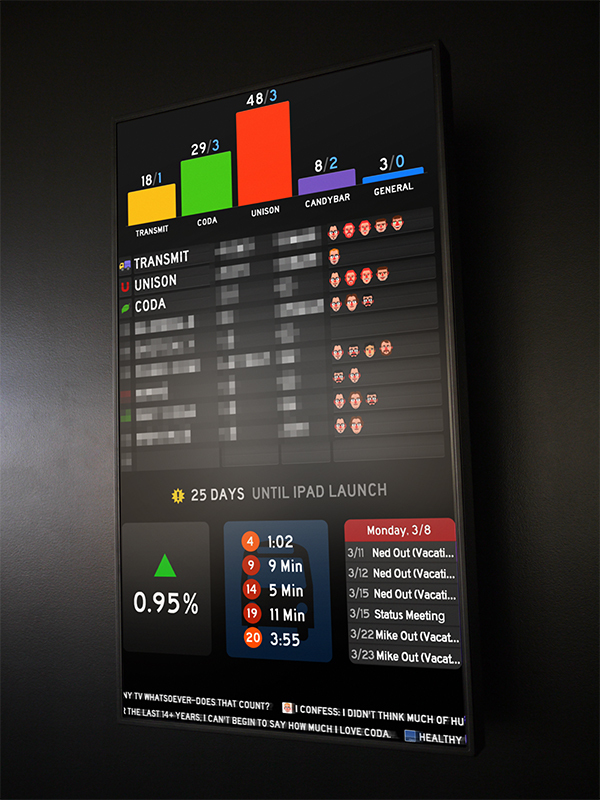 Panic is close to releasing an iPad app called Status Board that makes it easy to create an office dashboard and stream it to a television. However, the “big board” market is still young. Hopefully, there will be plenty things to look forward to in future.